One of my ongoing quibbles with the chattering classes is the usage of fascist. They toss it around like an insult while pretending to not know what it means, or worse, not having a clue to what it means. For one thing, it is an insult to me because I do not have a socialist spec of blood in my body. When I point this out, they get upset and say or type it in all caps - FASCIST! If anybody tells you that Hitler invented it, that is either a teachable moment or grounds to dismiss them to protect your sanity. No Nazi ever called himself a Fascist and Hitler joined the already existing National Socialist German Worker's (Nazi) Party when he was supposed to be spying on them for the German government and Mussolini's Fascist Party was already big in Italy. The Leftist problem is one of their own making that keeps biting them when they try to express themselves in written or spoken language. The problem of changing the meanings of words at a whim until they become meaningless. In actuality, Fascism is a form of Socialism, of the National Socialist variety. Nazism is a form of Socialism too, also in the National Socialist group. Mussolini used it as a vehicle to promote Socialism in Italy because his beloved Communist party was not gaining enough popularity to impose "fairness and equality" on everybody in Italy. Remember, to the Socialist, fairness is stealing other people's property and equality is equality of misery for everybody but the smart people running the show. International Socialism or Communism, is experiencing the same X-Brand Socialism makeover as I type. A growing chorus of neo-Socialists proclaim that Communism was not Socialism and object to the term International Socialism as some sort of slander. 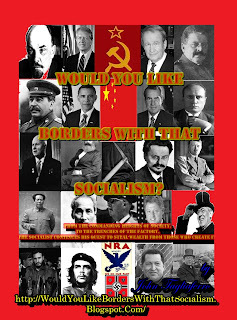 All that is fodder for another post and will be examined in depth in How Many Borders Would You Like With That Socialism? Now, what were the major National Socialist regimes of the World War II era? Italy, Germany, France and Spain for sure with the United States, England and the Soviet Union making 'valiant' attempts at becoming National Socialist regimes, with the Soviets remaining the only totalitarian regime of that set. Now, how many Jews did each round up and murder? I wanted to use Jonah Goldberg's Liberal Fascism citation of Franco's repeal of the 1492 Spanish Edict of Expulsion (Alhambra Decree), however Franco did not repeal that act until 1968. Mussolini was never a big fan of anti-Semitism like his fan and ally Hitler was. Jews of Rome occupied high positions in Mussolini's Fascist party, like Aldo Finzi, from the beginning and up to 25% of the Jewish population were party members. However, the same anti-Semitism that swept Europe in the late 1930s showed up on his desk around 1937 and a series of anti-Jewish laws were enacted. By 1940 Mussolini created the Campagna camp and housed Jews there, refusing to deport them to Germany. Italian resistance to German demands for Jews to be sent to their death was blatant. The Italian commanders in Croatia and France refused German demands outright, with support from Mussolini. No Jew was relocated to a German concentration camp until 1943, after Mussolini was voted out of power and jailed. When the Germans took control of Italy, they found the Campagna camp empty, but still managed to find some 7,500 Jews to send to Auschwitz, despite the efforts of the Italians to shield them. It is estimated that the Germans rounded up 20% of the Jews in Italy for the "Final Solution". The Vichy French government engaged in more than collaboration with the German 'occupiers,' they kept several steps ahead of the Germans in sending Jews to their deaths. On 3 October 1940 they enacted Statut des juifs, The Statute on Jews, before the Germans so much as asked. 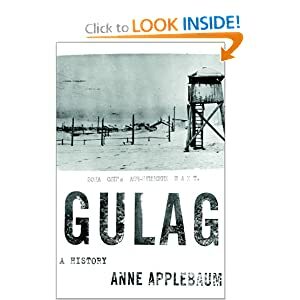 Jews were stripped of French citizenship, prohibited from serving in the military, prohibited from changing residences, and rounded up into French concentration camps to await deportation to German death camps. It is estimated that 26% of the Jews in France were murdered in the Vichy "Final Solution". Werner Goldberg "The Ideal German Soldier"
It is estimated that 88% of Jews in Germany/Austria lost their lives to the "Final Solution". However, the Germans did not exempt "half" and "quarter" Jews from conscription. The number would have been higher had it not been for Jewish war heroes returning from the front only to find their families on "relocation" lists. Frequently, these soldiers were able to shame the bureaucrats into leaving their families alone, for a time. See Hitler's Jewish Soldiers by Dr. Bryan Mark Rigg. Watch him on C-SPAN's BookTV. So, what we have here is two National Socialist regimes, that never called themselves Fascists, who rounded up Jews and others for extermination. So, where does the pejorative Fascist come from? One rule to remember about Leftists and Socialists: facts are meaningless. They decided, sometime way back when, that since the Italian Fascists eventually allied with the German National Socialists, then they could all be called fascists. A side note, since all the cool Socialists love France (the birthplace of National Socialism) a whole false history has been created for the French, one that substitutes the actual French reaction to German occupation with the Italian resistance to German occupation. The Leftists want you to believe Nazi collaborators in France were rare. 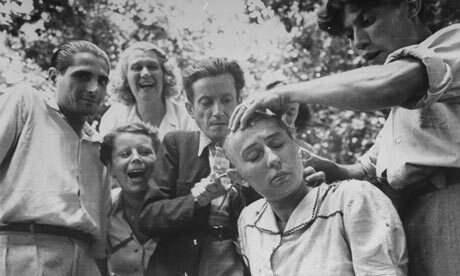 Now the story goes, every single French citizen was a member of the underground, save the women of Paris whose heads were shaved after the Allied liberation, and each home hid twenty Jews in the attic and another dozen in the cellar. That fits more with the Assisi underground in Italy than anything that happened in France. Remember, when someone calls you a fascist or a Nazi, 1) they probably do not know what they are talking about, 2) you are probably winning an argument. A tragic and timely story for some research on Would You Like Borders With That Socialism? Note that the source of the contaminated fruit does not appear for ten paragraphs, which fits with a design to induce general panic, rather than helping anybody look for the problem. Here in the US of A, we have had an expensive and intrusive food bureaucracy since the Wilson administration. In fact, ranks of the food Nazi regime have been growing ever since, all in the name of "food safety." The food safety legions are not held responsible for the spread of any disease that they are supposed to be protecting the nation from, they are only responsible for the random punishments. They are also responsible for armed raids on food producers, like the little raw milk suppliers that are popping up all over the place since its partial 'decriminalization' in recent years. My first attempts at finding any death statistics from raw milk and raw milk product consumption, as well as other deaths from foodborne pathogens, is going a bit slower than one would imagine if this is such a serious problem. The outbreak has been traced to Jensen Farms in Holly, Colorado, which recalled the tainted cantaloupes earlier this month. The Food and Drug Administration said state health officials had found listeria in cantaloupes taken from grocery stores in the state and from a victim’s home that were grown at Jensen Farms. Matching strains of the disease were found on equipment and cantaloupe samples at Jensen Farms’ packing facility in Granada, Colorado. The article is not very clear that this was a voluntary recall. There is no mention of any government pressure, no phone calls from Washington, DC saying, "You know, that is a pretty farm there, would be a shame if anything happened to it." No, the farm recalled its 300,000 melon harvest all on its own as soon as it discovered the problem. The sort of thing the Socialist Statist establishment would have you believe never happens until the government makes it happen. Sadly, this will never be the face of the modern food Nazi. Funny thing is, the Leftist/Socialists keep saying that business never does this, yet they have little evidence to prove it is true. Of course, they have no evidence that any farmer ever got away with intentionally killing people for profit. UPDATE: The food Nazis have an exhibit in the National Archives - What's Cooking Uncle Sam? We demand that our Government ensure that it is safe, cheap, and abundant. In response, Government has been a factor in the production, regulation, research, innovation, and economics of our food supply. It has also attempted, with varying success, to change the eating habits of Americans. Interesting. I think I found a great wealth of misinformation/disinformation for my book. Several years ago I saw Chicago: City of the Century, on a Washington, DC area PBS station. What is amazing about this documentary, like many others, is that it blatantly destroys fallacies of the Left without a single cry from a Leftist. Swift: Gustavus Swift would walk out to Bubbly Creek, which was this terrible little sewer that ran out of one of his plants, with his top hat, his dark suit, he'd have his pants tucked into his Wellington boots, and he would wade into Bubbly Creek to check what was coming out of the sewer. And if he saw any grease or fat then he knew that was waste because you could have turned that into lard. And he'd go back and he'd find the source of how that happened and correct it. He was a very hands on manager. 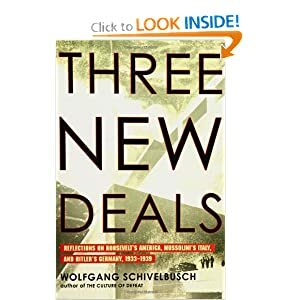 Nancy Koehn, Historian: You can't understand industrial capitalism without understanding the importance of pennies, half cents, a tenth of a cent, a hundredth of a cent. And when you think about millions of pounds of beef being processed through a single plant in a year, you begin to understand why a hundredth of a cent was something that kept Swift and Armour and other industrialists up at night. Get that? No government agency was poking around looking for "pollution." The 'evil capitalist' owner was looking for sources of waste and eliminating them. How could the editorial staff of Slate and The Nation miss that one? Probably because they want federal money squandered on PBS and they do not bother witnessing what is escaping from Room 101. Part 2 continues and makes quite a few of the expected Leftist mistakes that one would expect from PBS. Like how railroads had cut wages by 40 percent. They actually mention this happened just after the end of US slavery, but fail to connect the dots. Two dots really, new labor flood begets lower wages. This is also the part that covers the rise of Socialism in the USA, in 1877, with the Bohemian pied pipers from what is now the Czech Republic. (Just 23 years later, Yellow Socialism, aka, National Socialism, would emerge from the same area). It mentions how members left the Socialist Labor Party and joined the International Working People's Association. Without any fanfare, PBS casually mentions that the IWPA is an "Anarchist" organization, without noting that the big difference between the Socialists and Anarchists is nothing but the label. Even in 1877, Anarchy and Socialism were identical. Albert Parsons, publisher of the Alarm, moved effortlessly between Socialism and Anarchy. On Thanksgiving Day 1884 the anarchists unveiled their new symbol. The black flag of hunger and death joined the red flag of social change. Narrator: The Sunday picnics that Chicago's Germans enjoyed became more than picnics. They were a chance to spread the word and recruit. One Sunday, anarchist leader Samuel Fielden spoke of the wonders of a new invention, dynamite, which, he said, "science has placed within the reach of the oppressed." On Thanksgiving Day 1884 the anarchists unveiled their new symbol. The black flag of hunger and death joined the red flag of social change. Playing the anthem of the French revolution, the Marseillaise, they began a march which took them past Potter Palmer's elegant hotel, the Palmer House. Then on to the Prairie Avenue mansions of the capitalists who had "deprived them," their leaflets said, "of every blessing during the past year." "Every worker, every tramp must be on hand to express their thanks in a befitting manner." Miller: They're marching down Prairie Avenue, okay, the very citadel of capitalism. And it's hard to march on a plant, but they're right at the homes of the capitalists. Never happened anywhere else like that. They collect what they call hoboes but they're anarchists as well. And they're going up and they're ringing the doorbells. And of course nobody's answering the doors. But they're screaming that they want bread or power. There'd just never been a direct demonstration quite like that. Narrator: Albert Parsons read from the Epistle of St. James: "Your riches are corrupted...Your gold and silver is cankered, and the rust shall eat your flesh as it were fire...We do not intend to leave this matter for the Lord," he concluded. "We intend to do something for ourselves." Narrator: They approached the Prairie Avenue mansion of Marshall Field, whom Parsons had attacked for discriminating against immigrant women shopping in his store. "Our international movement is to unite all countries and do away with the robber class," Samuel Fielden told the marchers. "Prepare for the inevitable conflict. "They marched on the Prairie Avenue mansion of George Pullman. Adelman: George Pullman was absolutely horrified with the sight of poor people walking up his street and ringing his doorbell. The next day he went to his attorney, Wert Dexter, and he said, "I want you to get this guy Parsons." Schneirov: They were Catholic, they didn't speak English, they spoke German, they drank beer on Sundays, they went to saloons on Sundays. They were a threat. They were totally alien to this American, Protestant way of life. Narrator: They marched on the Board of Trade when it opened an elaborate new building on LaSalle Street the next year. "The Board of Thieves", they bellowed, stood for "starvation of the masses, privileges and luxury for the few." One in the crowd yelled, "Blow it up with dynamite." To Chicago's business leaders these were not idle threats. Miller: They're reading in newspapers about assassinations abroad. There're people being killed in Europe, including Czar Alexander at this time. The movement is extremely strong in Germany And now their speakers are coming from Germany to agitate. So they know the anarchists are serious. Narrator: "The better classes are tired of the insane howlings of the lowest strata," warned General Phil Sheridan, "and they mean to stop them." On May 1st 1886, the anarchists did something unusual. They teamed up with the main stream labor movement - disgruntled railroad workers, packinghouse butchers, Bohemian socialists. Albert and Lucy Parsons led 80,000 workers down Michigan Avenue as part of a nationwide strike for labor's big issue, an eight-hour day. With its Mayor Carter Harrison supporting it, Chicago became the center of the strike. Pacyga: "Eight hours a day for work; eight hours a day to sleep; eight hours a day to play in a free Americ-kay." Schneirov: The anarchists didn't lead the eight-hour movement, but they attempted to commandeer it. August Spies, felt strongly that this was a demand that was, in effect, a revolutionary demand, even though it didn't openly say so. It was a demand that could not be won under the existent circumstances, and it was a demand that would inevitably lead the eight-hour movement into a revolutionary situation, under the leadership of the anarchists. Miller: They told capitalists, Your function in life is to die. We're going to get you. We're going to bomb your factories. We're going to tear apart your system. The general strike's going to bring down capitalism. You'll be shot afterwards. Pacyga: The streetcar lines are shut down. The city is shut down. This is a general strike. And there's tremendous amount of tension. Workers, of course, were winning, you know, the eight-hour day in the packinghouses. Narrator: Workers struck the packinghouses on May 2nd. The packers, Chicago's largest employers, conceded to an eight-hour day - the same pay for eight hours that workers had gotten for ten. What happened May 3 at the McCormick Reaper Works got the anarchists involved in another labor dispute and ignited the most sensational labor incident of the 19th century. Cyrus Hall McCormick, the Reaper King, had died in 1884. A floral reaper adorned his casket. His last words were "work, work, work." His son mechanized the plant. Blades that used to be forged by hand were now forged by steam hammer. This threatened the skilled iron workers. In May 1886 they had been on strike for months. McCormick hired scabs to take their place. Schneirov: The McCormick strike was over a long-standing dispute that had begun before the 8 hour day had begun, that turned on the attempt of McCormick to mechanize the whole process of iron molding and thereby to get rid of one of the strongest unionized forces, the iron molders union. And these were largely Irish. And so there was a very bitter struggle that was going on at that time. Some of the Bohemian lumber shovers and other socialists and anarchists had gone up there in solidarity with the McCormick workers. August Spies had made a very militant speech. Narrator: When the whistle blew to end the shift on May 3rd, locked out strikers attacked the scabs as they left the plant. Police rushed in to protect the scabs. They killed two of the striking workers. Adelman: Spies witnessed this, from behind a boxcar. He saw it. And he ran back to his office on Wells Street and he wrote a protest, and he left it on the desk and said, I want this circulated the next morning. And he told them to put a banner on it. Well, to his great dismay the banner that somebody put on it was "revenge", which was the last thing that should have been put on it. Because he didn't mean it to be that kind of thing. Narrator: A second circular called for a rally the next evening at Haymarket Square. Haymarket Square was an open air market by day. By nightfall on May 4th, the pushcarts were gone. Chicago's popular mayor, Carter Harrison, was there and made certain the crowd saw him. It would ensure order. Pacyga: It was a very peaceful rally. The anarchists were saying things that they always said. Death to the owner class, revolution. Mayor Harrison rode up and everybody yelled, "Hoosah, hoosah, Mayor Harrison." You know, and he took his hat off and he waved at the people and said his little campaign thing. And he stayed at the back and then the police captain, Captain Bonfield, came up, said, "What should we do with this rabble, sir?" And he said, basically, "Let them speak. They've said many worse things than they're saying tonight. And there's no one here. And he says, "I'm going to go home," and he goes home. Narrator: Captain Bonfield dismissed most of his men. Not all. The last speaker, Samuel Fielden, remembered the men shot at the McCormick Works: "The law is framed for...your enslavers.," he said. "Throttle it, kill it...do everything you can...to impede its progress." Bonfield considered this inflammatory. He ordered the police to march. Fielden was winding down. "He that has to obey the will of another is a slave. Can we do anything except by the strong arm of resistance? ...War has been declared on us. People have been shot. Defend yourselves!" No one noticed the man lurking in the shadows. "Any animal will resist when stepped upon. Are men less than snails or worms?" In the name of the state of Illinois, I command you to disperse," the police captain said. "But we are peaceable," Fielden protested. Narrator: Seven policemen were killed, mostly by friendly fire. The Chicago Times called the workers "rag-tag and bobtail cutthroats of Beelzebub from the Rhine, the Danube, the Vistula, and the Elbe." Labor's largest paper called them "wild beasts." The respected Albany Law Review called them "long-haired, wild-eyed, bad smelling, atheistic, reckless foreign wretches." So, there you have it (and there is more in the documentary), a bunch of Anarchists, indistinguishable from Socialists, attacked innocent workers as they left the McCormick plant. The police were protecting victims under attack and some violent attackers were killed. Somehow over history, and a bit in this documentary, this has been twisted by the Leftists as some heroic stand for the Labor Movement. In reality, it was a bunch of thankless children in adult bodies who fell for the nonsense that fair wages were not enough and they deserved a business that they never invested a dime in. The Albany Review was down right prophetic in describing the later rally attendees as "long-haired, wild-eyed, bad smelling, atheistic, reckless foreign wretches," since nothing about their appearance or manner has changed in over one century. Update: In a probably unwitting attempt at freshness and uniqueness, the funky, smelly #Occupy crowd plan to replicate the Prairie Avenue incidents mentioned above, this time in the Chicago suburbs, as reported by Roe Conn and Richard Roeper on WLS 890 AM, Chicago. Targets include towns where "high profile members of the 1% live" Check for updates on their blog. Something very disappointing about this post is how hard it was to find the PBS information, vs. a CSPAN clip. PBS does not have the video online, one must order a DVD. If it were on any CSPAN channel, it would be free to view and share. Finding the transcript was easy, if you knew of its existence in advance. Trying to find it through the events mentioned is fruitless. Hopefully, this humble blog post will help others find this hidden gem for their research. I have always taken issue with fascism and National Socialism being used interchangeably. The biggest problem comes in speech, when one says Fascism but they mean fascism, Yellow Socialism, or National Socialism It is similar to the confusion between an asymmetrical airfoil and a symmetrical airfoil. Using symmetrical and non-symmetrical clears that up nicely. So does using National Socialism for what it is, Socialism with a nationalistic marketing plan, no matter if it is Germans, Israelis, Italians, Spaniards, or Americans doing it and leave the Fascism to Mussolini era Italians. One thing this convention does is it removes a bad rhetorical 'weapon' from the Socialists who want to confuse the issue. For example, when they call people fascists when they mean Nazi. Now, no member of the National Socialist Worker's Party ever called himself a fascist and no Italian Partito Nazionale Fascista (PNF) member would ever call himself a Nazi, and neither would sit still to be called one either. However, every member of each group is in fact a Socialist and a National Socialist. Similarly, the International Socialists are Communists, be they Leninist, Stalinist, Marxist, or any of the others. Trotskyites do seem to fall in the National Socialist camp of the Marxists, for now. The Socialists get a bit irate when one lumps them together. Similar to when various members of religious factions are misidentified. The Communist takes offense at the label Nazi, even though they were allied and voted with each other in the German parliament (Bundestag). Also quite similar to an American baseball Cincinnati Reds fan who takes offense at being called a Boston Red Sox fan. In fiction, the Monty Python players captured this in their film, The Life of Brian, through the use of political satire. 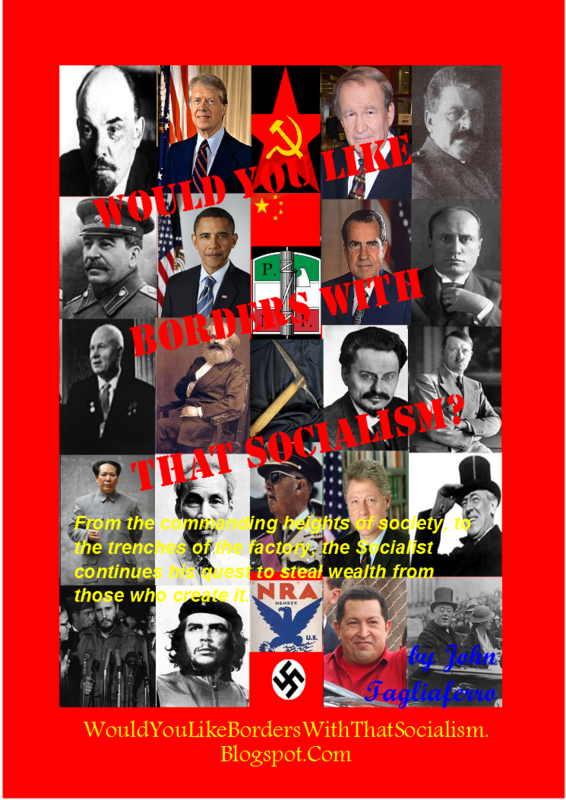 In my upcoming book, Would You Like Borders With That Socialism? I try to stick with the convention of a fascist being a Fascist of Italy, and a Nazi being a member of the National Socialist German Worker's Party. All are National Socialists and all Socialists. The differences appear to be with their marketing strategy and body count. On December 24, 1971, the New York Times ran one of the first of many articles on a new holiday designed to foster unity among African Americans. The holiday, called Kwanzaa, was applauded by a certain sixteen-year-old minister who explained that the feast would perform the valuable service of "de-whitizing" Christmas. The minister was a nobody at the time but he would later go on to become perhaps the premier race-baiter of the twentieth century. His name was Al Sharpton and he would later spawn the Tawana Brawley hoax and then incite anti-Jewish tensions in a 1995 incident that ended with the arson deaths of seven people. Great minds think alike. The inventor of the holiday was one of the few black "leaders" in America even worse than Sharpton. But there was no mention in the Times article of this man or of the fact that at that very moment he was sitting in a California prison. And there was no mention of the curious fact that this purported benefactor of the black people had founded an organization that in its short history tortured and murdered blacks in ways of which the Ku Klux Klan could only fantasize. The House or the Cancer? Your Winnebago or your life? In today's National Review column by Jonah Goldberg, Tyranny of the Typical, he covers a recent Wolf Blitzer/Ron Paul face-off during a Republican debate. I find myself surprised that the long running, frequently posed, false dichotomy has not been tossed out against Doctor Paul in the wake of the debate: Someone lost their house because they had to pay for their own healthcare! Perhaps that nonsense is still going on at Slate, The New Republic, and other bastions of socialism thinly hidden behind their latest Progressive banner? At any rate, that was the topic I wanted to cover here and I shall hijack this debate question for my own sinister ends. So, there was this old woman who lived in a house and she got cancer. She had several well-to-do children and grandchildren and they did not know what to do. The old woman had some insurance, but the did not have the foresight to purchase insurance with an infinite benefit, but her house was worth a fortune. So, the grandma was faced with a dilemma: sell the house to pay medical bills, or die and leave the house free and clear to her well-to-do relatives. Of course, if the government were not ruled by 'Corporate Nazis' she would have universal healthcare and be cured. That is why we need Hillary/Gore/Kerry/Obama Care, or those fascist Republicans will kill her! I made up the version above, so the details are different, but the story is the same from one year to another. My favorite version was from candidate Al Gore about one Winifred Skinner, who was reduced to collecting aluminum cans to pay for her prescription medications. The truth was, her son has always offered to pay for anything she needed and she had other sources of income. To make it look even worse, and I am surprised that Karl Rove was not given credit for the Winnebago portion of the story. This 'poor' woman, who could not make ends meet, drove from Iowa to Boston for the event in a Winnebago. Turns out, the vehicle and gas were furnished by the Gore campaign. Now, to what sort of Leftist, Socialist mind is this a sympathetic character at all? Only the loftiest of limousine liberals could possibly believe that adding a comfy recreational vehicle to this story makes it a bigger tearjerker! So, imagine the woman really had a Winnebago. What is more important, the drugs or the vehicle? Yes, that is a serious question. I have known people in my almost half-a-century on this earth who really would rather spend the last of their wealth on comfort over care that may prolong their lives for a few more years. These are known as practical people. The practical folk do not rely on others when they can do for themselves, well frequently anyway. There is a range, I am sure, where they may grudgingly ask a friend or relative for assistance. They are the opposite of the socialist, who will demand from all of society that they are provided for with the lifestyle of their choosing. Many a college professor and politician come to mind. The real question is: What is more important, your health or your stuff? The socialists turn it into a punchline from a Jack Benny routine. So, in the mind of the urban and suburban Leftoid, it is perfectly fine for the McMansion to remain the property of the ailing grandmother whilst the rest of us pay for her hospital visits and drugs so that a new generation can have an inheritance, at a value below the "rich kid" death tax rate, of course. So, how did America survive before the government rushed in to save us from certain death and poverty? Scroll back up and read Ron Paul's quoted answer. So you think gays in the military is new? Ernst Julius Röhm and the Hitler gang did it long before Clinton and Obama. A couple of notes here. The article has a good timeline on when the events pertaining to the SA, the Brown Shirts, who were a mostly homosexual paramilitary organization. Think of them as Hitler's Leather Men, armed to the teeth with a passion for cracking skulls. The article falls short in falling for the utter nonsense that Hitler was not a Leftist. He joined the National Socialists when he was supposed to be infiltrating them because he liked what they had to say, agreed with destroying capitalism and expanding social handouts. He did get support from large corporations, the corporations that wanted to continue their existence and had little problem sucking up to the new sheriff in town. Additionally, Hitler used groups cast to the fringe for his advantage before throwing them under the bus. The same as Obama did his own grandmother. 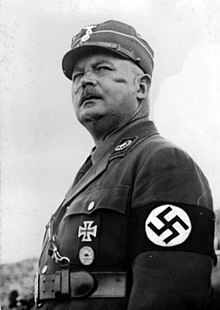 Some historians wish to hold the party line that the homosexual makeup of the SA is some modern Right wing fantasy, even though Ernst Röhm was openly gay and that is well documented. Röhm was arrested in bed, with his younger male lover, by Hitler and executed ten days later. 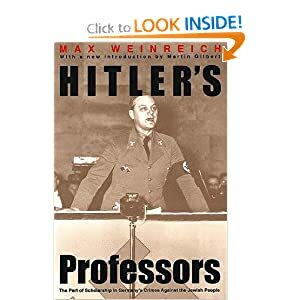 At the time, Röhm was one of the only people who could challenge Hitler for leadership of the National Socialist German Worker's Party and that was certainly not coincidental to his execution. Wikipedia is not evidence, but . . . I never much looked into the FDR concentration camps for Italians and Germans during WWII. 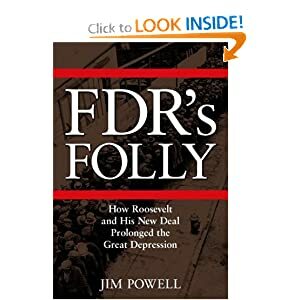 Most everybody knows of the FDR concentration camps for Japanese Americans and I have heard a lot of justification for it from different sides. Well, more like different flavors of Leftists. I suppose that the support was the usual boilerplate on their favorite National Socialist in the USA. Anyway, the links above have some numbers to go with them, use it as you will. 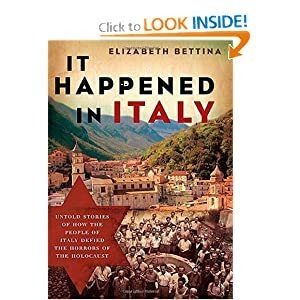 In her well researched and documented book It Happened In Italy, Elizabeth Bettina documents how Jews were treated in Italy during the days of Il Duce. Contrary to some accounts, she has documentation of concentration camps being set up well before the 1943 German invasion of Italy. However, the personal accounts of the survivors are quite a bit sunnier than those of the Japanese who were rounded up by FDR and heavenly when contrasted against any concentration camp survivor under Hitler. These differences are the basis for a section in Would You Like Borders With That Socialism? that compares the various National Socialist regimes that were at war with each other from the onset of the Spanish Civil War through the Cold War. A comparison between National Socialism and International Socialism is in the works for another section, but honestly, there is so little difference that it is hard to write very much on that. 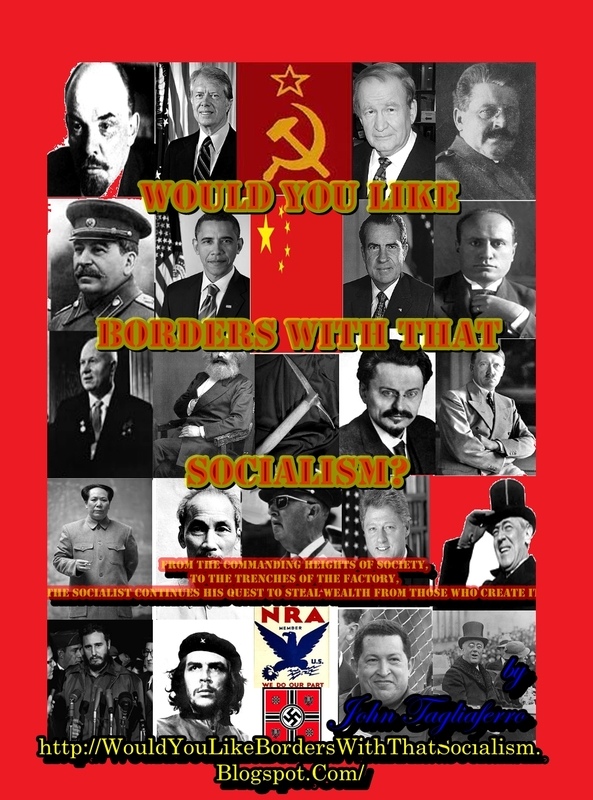 Just arranged a new YouTube playlist for Would You Like Borders With That Socialism? As of this writing, it is a set of six Jonah Goldberg video, speaking of his great book Liberal Fascism, plus a great BBC video of Useful Idiots. Adding a few more books to the left margin. All are must reads. More to come. Finally, I found PhotoScape, the program I used to make my other covers before my hard drive crash. 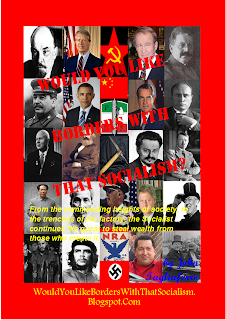 Still had to do some reconstruction, but this is the final cover for Would You Like Borders With That Socialism? This is the cover I am working on right now. Sadly, I am not a whiz at Inkscape and I cannot remember what the heck freeware I was using for the Suki series covers. For some reason, black borders around text does not translate from .svg format to anything else. Online converters try valiantly, but fail against the mighty .svg file format. I think that I have most of this book in my head now. The only hurdle is writing it down in a manner that others can follow, or at least stand to read. The experience is a little strange, because I used to write papers, studies and long reports when I made my living as a defense analyst. However, those writings were not for that broad of an audience. There was always someone around to proof read too, and I am doing this solo. My other books are fiction, set in the future, which is easier and harder than doing this. It is easier because, in fiction, I invent the world that the characters populate. Fiction is harder because In have to remember what I made up throughout a series. 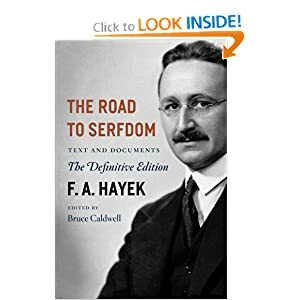 I have no problem with consistency in non-fiction, but Socialists and Leftists have none of these problems, because they do not let that pesky consistency bother them. Actually, the vetting of anything I touched in defense was reviewed, proof read, shot at, blown up, rewritten, and required approval of so many other analysts that it was nearly impossible for it to escape into the wild as bad work. 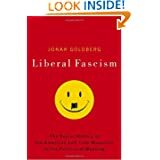 I am still reading Jonah Goldberg's book, Liberal Fascism. 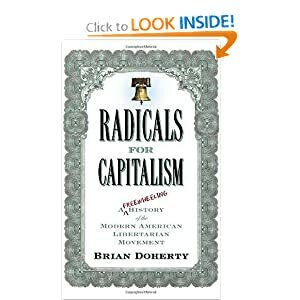 I cannot stress enough what a must read book this is for any Libertarian, libertarian, conservative or Conservative. Small confession here, when I began this writing project I sought out a copy of Liberal Fascism only as a reference source for my new book. There was one, and only one, copy at Barnes & Noble and my only intention was to find a few important references that Jonah mentioned when he was speaking to the Heritage Foundation. Being generous here, I will estimate that it took all of ten minutes for me to decide this paperback needed to be on my bookshelf. It has been my constant companion, second only to my fiancee, for the past week. See my YouTube channel under Favorites for video of Jonah Goldberg speaking before Heritage and at the Rio Grande Foundation. One "problem" with this project is, like many other things, I thought of or observed many things that others have written about already. Liberal Fascism covers more of things I thought of, within the scope of modern political divisions and their roots, than any other book I have found. If that were all there were to it, I could just pass around writers and essays that match what I like and believe, help others to see the fallacy of Socialism, and be done with it. Well, there is something else that I hope to bring to the table. I see other connections that others seem to miss, or at least they do not connect them together. 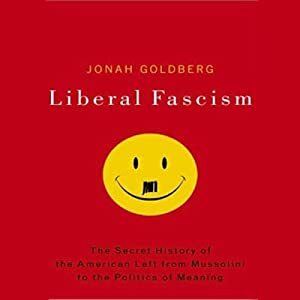 Sticking with Liberal Fascism, Jonah writes at length about the Leftist/Socialist connection to Moscow. There is a lot more to that than most political writers seem to acknowledge. For this post, I leave you with yet another misuse of Fascist/Nazi combined with disinformation all rolled into one. A video clip I shot 10 OCT 2010 that includes a Lyndon LaRouche supporter 30 seconds into the video. If you do not know, the Lyndon LaRouche camp are the Democrats who show up at rallies with photoshopped posters of Obama wearing a Hitler mustache. I allowed the LaRouche supporter to give his spiel about what they stand for. Basically, they are for everything the Nazis were for, minus the genocide, but they paint Obama as Hitler. I think the better image for Obama would be a black shirt with that cute little Il Duce cap and fasces.